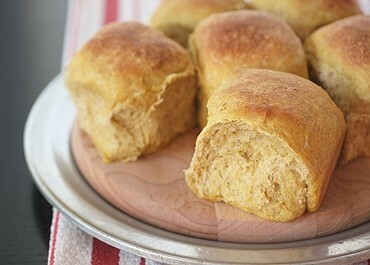 Delicious rolls subtly flavored with pumpkin and pumpkin pie spice; an excellent accompaniment for ham. Place room temperature ingredients in pan in order listed. Select DOUGH setting. When cycle is complete, remove dough. Check dough consistency after 5 minutes of kneading. The dough should be in a soft, tacky ball. If it is dry and stiff, add water, ½ to 1 TBSP at a time. If it is too wet and sticky, add 1 TBSP of flour at a time. See our Bread Machine section for more helpful tips and information. Continue with Shaping, Rising and Baking. Combine yeast, 2 cups bread flour, and other dry ingredients. Combine water, oil and pumpkin; heat to 120° to 130° F. Add to flour mixture; beat 2 minutes on medium speed. Add eggs; beat 3 minutes. By hand, stir in enough remaining bread flour to make a soft dough. Knead on floured surface 5 to 7 minutes until smooth and elastic. Place in lightly greased bowl; turn to grease top. Cover; let rise until dough tests ripe. Turn dough onto lightly floured surface; punch down to remove air bubbles. Divide dough into 3 parts; divide each third into 5 pieces. Shape each piece into a smooth ball. Dip tops in melted butter. Place in greased 13 x 9- inch pan. Cover; let rise until indentation remains after lightly touching side of a roll. Bake in preheated 375°F oven for 20 to 25 minutes until golden brown. Remove rolls from pan. For soft sided rolls do not break apart. Cool on rack. Pull Apart Dinner Rolls, Adapted for Sweet Potatoes!